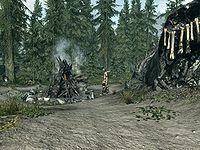 Cradlecrush is a location in the Eastmarch region of Skyrim, located far southwest of the city of Windhelm, on the banks of the White River. Cradlecrush was the site of an ancient Orc stronghold, which existed until at least 2E 582. In that year, Fildgor Orcthane, brother of Jorunn, High King of Eastern Skyrim, reappeared in Eastmarch and attempted to overthrow his brother. The Orcs of Cradlecrush allied themselves with Fildgor, and captured mammoths belonging to local giants, to use them against Fort Amol. Their plans were foiled by the Soulless One, who attacked the fort with the help of angry giants, and then killed the Orc chieftain, Lob the Cleaver. The remaining Orcs fled from the stronghold afterwards, and the giants settled there in their place. By 4E 201, nothing remained of the stronghold, and the area became the site of a small giant camp, Cradlecrush Rock. For game-specific information, see the Skyrim and ESO articles. This page was last modified on 21 October 2018, at 08:18.